Today’s air quality is a far cry from where we’d like it to be. While technological advancements make life easier the also contribute to low air quality, worldwide. Many people assume that staying indoors will save them from the harmful effects of airborne pollution. But, the truth is that indoor air is often worse than the air outside. With the more pollutants in the air, many people see worsening asthma, allergies, and other respiratory issues. So, many people rely on air purifiers to help clean the air in their home. There are a lot of brands and models of air purifiers. And, each one boasts a diverse set of features and advantages. 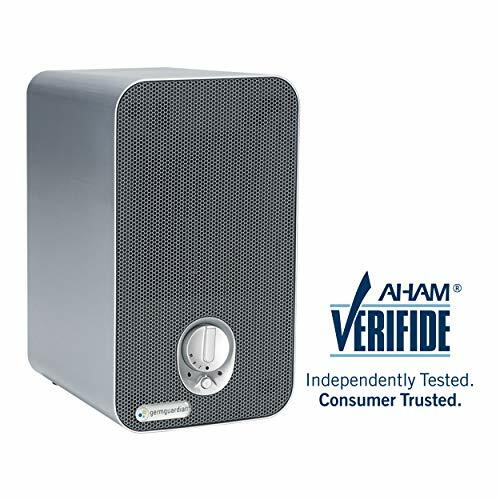 One of the most sought air purifier system in the market is the GermGuardian AC4100 3-in-1 HEPA Air Purifier System. This article highlights the features and benefits of this great air purifier. The GermGuardian AC4100 features a distinct set of features that can help homeowners and business operators alike in improving indoor air quality. This air purifier system is ideal for those who are suffering from allergies, asthma, and other similar respiratory diseases. 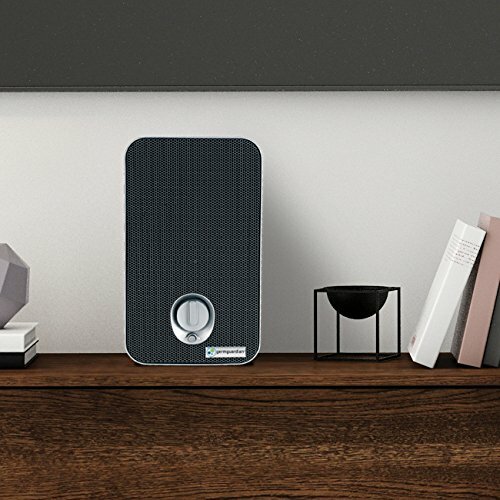 The GermGuardian AC4100 is table-top air purifier system that sports a compact and minimalistic design. It features a speaker-like design which means it can be inconspicuously placed in any part of your home or office. The purifier measures 7.5 x 6.5 x 11 inches. It is also incredibly lightweight at only 3.9 pounds which make it easy to transport the unit if you are going to travel. Its cord measures 6 feet long. The GermGuardian AC4100 is praised for its efficiency as it features three-stage filtration system. This amazing feature of this air purifier system allows you to easily eliminate various airborne contaminants such as allergens and household odors. The GermGuardian AC4100’s filtration system follows a proven and thorough filtration process. On the first stage of the filtration process, the contaminated air passes through the machine’s activated charcoal pre-filter that effectively traps and eliminates airborne bacteria and mold while effortlessly getting rid of odors and smoke particles. The next stage of the filtration process would be enabling the air to pass through the machine’s HEPA filter. During this stage, 99.97% of harmful particles in the air as small as 0.3 microns are captured by the machine’s HEPA filter. Some of these particles include dust, mold, pet dander, pollen and other airborne contaminants that trigger symptoms of allergies and asthma. During the third and last stage, the air is then treated with the machine’s UV-C light treatment feature, an innovative technology specifically designed to eliminate common germs on surfaces. This feature is also efficient in penetrating bacteria and other thin-walled viruses that are considered the roots of many diseases such as bronchitis, meningitis pneumonia, staph, and tuberculosis. It also effectively decomposes odor molecules in order to get rid of household odors caused by cooking, pets, and smoking. The HEPA filter is perhaps the main selling feature of the GermGuardian AC4100. The machine comes with an HEPA filter with activated charcoal pre-filter that easily traps 99.97% of airborne pollutants. These pollutants include allergens, germs, viruses, dust and household odors. It can also effectively capture pet hair and dander in case you have several pets at home. Depending on how you use the air purifier system, the HEPA filter can endure 6-12 months of regular use. The GermGuardian AC4100 comes with an innovative UV-C light technology feature. This capability enables the machine to kill common germs on surfaces, may it be in water or in the air. It is also effective at penetrating known bacteria and thin-walled viruses. This feature makes use of an ultraviolet light that efficiently alters the genetic structure of the germs, killing them in the process. The combination filter of the GermGuardian AC4100 comes with titanium dioxide or TiO2 that helps in hindering the development and growth of bacteria, mold and germs. The GermGuardian AC4100 Air Purifier System also features three different fan speed options namely low, medium and high. If quiet and satisfactory operation is what you are after, you can set the machine on low setting. However, if you are looking for an optimal air circulation, you can set the machine on high setting. However, the high setting emits some white noise which can be tolerable for many people. It also comes with an on/off UV-C control so that you can easily take full control of the machine UV-C feature. It also comes with a filter replacement reminder so that you will know that it is time to replace the machine’s HEPA filter. If you are on the hunt for a desktop purifier or something that fits on a shelf; the GermGuardian AC4100 is a solid choice. It’s affordable, performs pretty well, and looks great. However, there are some other great options out there that work just as well. For a great purifier at the same price point check out the Hamilton Beach TrueAir purifiers. Or, if you have a little extra money we recommend the Blue Pure 411 from BlueAir. Most air purifiers in the market cost several hundreds of dollars, but the GermGuardian AC4100 is one of the best air purifier systems in the market that cost less than $100. It is a small yet effective unit.